Many of you may have heard the sad news that Ann C. Crispin passed away of cancer at age sixty-three last week. One of the small comforts when an author passes is that she will be able to live on through her writing. To Star Wars fans, that means The Han Solo Trilogy, her main work in the universe. I don’t feel qualified to offer a eulogy to Crispin, who had an extensive career in the science fiction and fantasy community, but I can pay tribute to her Star Wars books, which were among the first I read as a boy stepping into the Expanded Universe. Crispin’s Han Solo Trilogy is one of the great achievements of the Bantam era. It’s unique in being the only story designed to be a more-or-less complete backstory of a major film hero. A side benefit of this, at least for someone with my taste for synthesis, is that the HST is one of the first major works of EU continuity synthesis, drawing from all over to build a story on what had gone before. 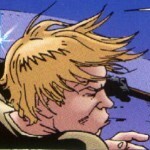 Crispin draws characters, backstory, and details of the setting from The Han Solo Adventures; the Thrawn trilogy; The Jedi Academy Trilogy; the Marvel comics; Darksaber; The Corellian Trilogy; Shadows of the Empire; the X-wing books and comics; The Lando Calrissian Adventures; The New Rebellion; I, Jedi; The Crystal Star; the Glove of Darth Vader series; and Dark Empire — and that’s just off the top of my head — and weaves them together into a powerful story that stands on its own merits as an examination of Han Solo’s character, a chronicle of his adventures, and a record of his maturation via a rich character arc. It’s quite an accomplishment. Crispin’s writing is mature, dealing with relationships, death, addiction, and depression honestly and seriously, but it never loses the sense of hope and adventure that distinguishes Star Wars. The books are rich but fun. The first book of the trilogy, The Paradise Snare opens with Han’s escape from the cruel con artist Garris Shrike, who, Fagin-like, runs a gang of child thieves and grifters. Han’s past with Shrike is established via backstory, but the novel focuses on nineteen-year-old Han’s efforts to define himself as a man outside the stifling, repressive confines of Shrike’s custody. Han strikes out to get a job as a pilot on Ylesia, a religious colony, in order to earn enough money to accomplish his real dream: gaining admittance to the Imperial Academy. A mixture of streetwise and naive, young Han grows through his partnership with his copilot Muuurgh, his budding romance with the young religious pilgrim Bria Tharen, and his growing realization that Ylesia is not a peaceful paradise, but something far more sinister. The climax of the book is astonishing, putting the young, still-idealistic Han through triumph and all-too-real heartbreak. Crispin brings great emotional depth and realism to Han’s story and takes on the issue of addiction head-on, growing Han as a character — something all too rare with the major protagonists — and giving the reader tons of space adventure. It definitely makes the most of its position as Han’s origin story. 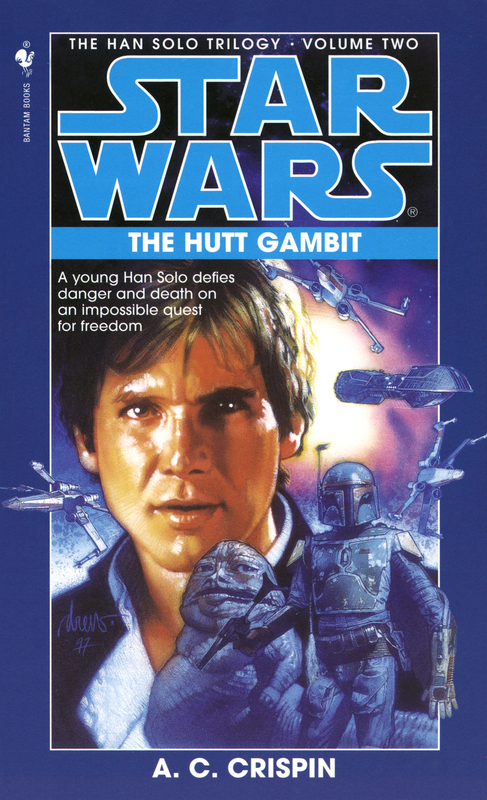 Skipping past Han’s time in the Imperial Navy, The Hutt Gambit opens with a depressed Han mourning the death of his dream, kicked out of the Fleet and blackballed from legitimate shipping jobs. His idealism crushed by the ugliness of the Empire and his dashed hopes, he retreats into the cynical shell we see in the films, reluctantly taking on Chewbacca as a partner. Just as The Paradise Snare was the story of Han’s maturation, this is the story of Han’s recovery of hope as he takes back control of his life, is drawn into the criminal underworld, and finds success there. Crispin deftly draws from all kinds of sources to build a portrait of Han’s early career as he takes on smuggling jobs for the Hutts and establishes himself in the smuggling communities of Nar Shaddaa and Smuggler’s Run. His friendships with Chewbacca and Lando Calrissian blossom, he is introduced to the Millennium Falcon, and he begins working for Jabba. The deadly criminal politics of the Hutt clans provide a meaty background for the action, into which Crispin delves with aplomb. The machinations of the rival Desilijic and Besadii clans underlie the trilogy, while tensions between the Hutts and the Empire lead to the book’s climax, in which Han and his Academy-dropout friend Mako Spince organize the smugglers and pirates of Nar Shaddaa into a defensive force that repels an Imperial strike that includes Soontir Fel. Han’s role as a military leader is an excellent example of the way Crispin foreshadows his inevitable development as a hero and his inherent nobility under the cynical exterior masking his emotional wounds without becoming too heavy-handed. 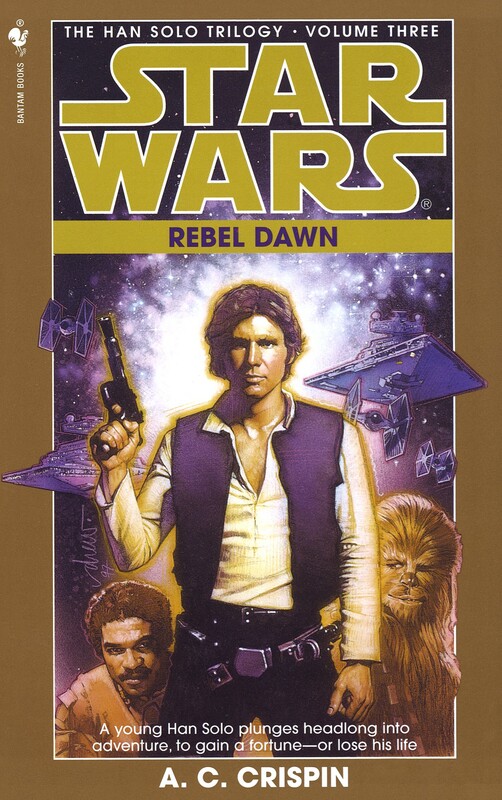 In Rebel Dawn, the narrative continues to follow Han as he wins the Millennium Falcon from Lando. He ends up taking a jaunt away from Nar Shaddaa, allowing Crispin to excellently integrate Brian Daley’s venerable Han Solo Adventures (themselves the certain subjects of a future Top Shelf), while the other characters around Han take over the narrative briefly. The Shakespearean machinations of the rival Hutt families remain riveting, while Bria gives the reader entry into the early days of the Rebel Alliance. When Han returns to Nar Shaddaa, Bria draws him into a Rebel plan to raid Ylesia. Betrayal ensues, and between that and the failed spice run that puts him in debt to Jabba, we see Han increasingly alienated and angry, moved into place for A New Hope. These three novels are examples of the Expanded Universe at its best. Not just for Crispin’s masterful synthesis of sources, but for their emphasis on mature character development, exciting adventure, and classic universe-building that turns the underworld and Hutt elements of the universe into a vibrant, vital setting. They not only develop a rich and endearing portrait of Han, but give Chewbacca and Lando more respect and development as characters than almost any other EU work. The Han Solo Trilogy is among the very best that the EU has to offer, and it is a great pity that I have to speak of it in the context of Ann Crispin’s death. Though she has passed on, it is a great comfort to her fans that she left behind such excellent and enduring work by which we can remember her. I heartily agree – Ms. Crispin’s HST is high atop the list of my EU favorites, and not just because the books are centered on my favorite SW character. It’s a complex character study that seeks to build something rather than the all-too-familiar using of the characters to drive a plot, characterization be damned. I’m not familiar with her out-of-SW works, but in the wake of her death, I’ve seen lots of accolades for those as well. My condolences to her family and friends. I hope it brings them comfort that she lives on in the joy she brought to readers. Cannot agree more. Paradise Snare and Hutt Gambit were my first Star Wars books, and it’s no surprise that they led me to become the EU fan I am today. I am also in full agreement! The climax of “The Paradise Snare” IS astonishing. So glad to hear that someone else thinks so, too. Han going from bittersweet triumph to utter heartbreak in that ending sequence is some of the most vivid and poignant storytelling I’ve ever read. 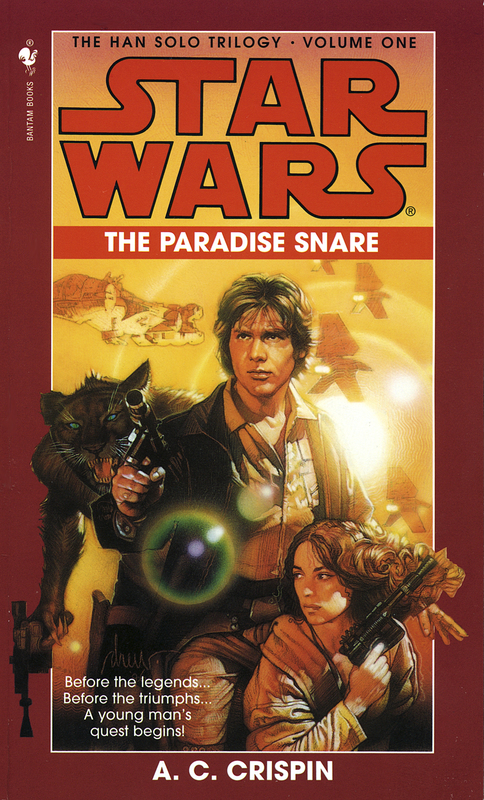 I love Ms. Crispin’s take on Han’s character throughout the book – and the whole trilogy, but I love her spot-on less-cynical version of Han in “The Paradise Snare”. The talkative, curious, cocky younger Han is fascinating and, in my opinion, masterfully crafted. The way you describe her depiction of his transformation into the more familiar, cynical Han in your first paragraph of your “Hutt Gambit” commentary is perfect. I had the honor of conversing with Ms. Crispin on a message board many years ago and she was so friendly and responsive, just a nice person and a class act. I am so sad about her passing and am praying for strength and comfort for her family and friends. I want to point out that Emily Asher-Perrin at Tor began her own HST retrospective today. It looks like a great complement to Lucas’.